Grandma’s Gone Surfing. What a great title for a blog! The GGS Blog, was my initial inspiration. There are five years of posts, written by a woman, who was not a grandma, but a mother, who had started surfing at the age of forty three. 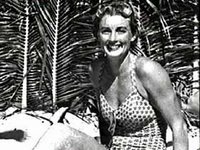 She was a good writer, with the heart and soul, of a surfer. Her writing style was intriguing. You always wanted to know what happened next. Her every post, is a detailed account. It’s as if you’re right there with her. You can feel her frustrations and her moments of glory. She’s comical sharing her aqua antics, with her newbie outlook. Her portrayal of the older woman, surfer struggle are too familiar at times. There can be a lot of conflict and aggression in the water. Personally, I try to not make it my cross to bear. Not out loud anyway. All surfers have conflict of some sort. Unlike Grandma, I’m really a grandmother and I’ve surfed for a long time. I can remember being eleven years old with my 9’6′ Rick Noserider. I use to stand on the sandbar and push myself into the wave. I would watch my friends, catching waves left and right. I wanted to do that! I never did catch a wave by paddling into it, until I was fourteen. I was so shocked. It felt zen. That’s the feeling that I have pursued through the years, over and over. Fortunately, in surfing, there’s always a new dawn. An example being, the first time that I came home from Costa Rica to surf hurricane waves in Florida. I was at the Fernandina Beach Pier. I charged a wave just like I would at Playa Avellanas, totally confident. I got slammed. It felt like hitting concrete. Ugh! It knocked the wind out of me. You always have to come up from under the water, like nothing happened, and just paddle back out. The next wave was the opposite. I was more selective about my wave choice and I was way more humble. I could see everyone turn and look as I took off. I caught the wave. It was well over my head. I could feel every bit of the power in that wave and I rode it to the end. Everyone in the lineup saw it, but they turned their heads real quick like they hadn’t watched. That’s what surfers do. I don’t golf or ride the rodeo, but that feeling has to compare to a hole in one, or a bullrider, hanging on for a full eight seconds. It was a great moment in my life. But so were the times of pushing the board into the waves. It’s all relative. All of those guys I surfed with back then, in 1967, don’t surf anymore and haven’t for years. I’ve witnessed a few generations of surfers passing through on the island, two in Costa Rica. Some stay with it, but most don’t. They disappear. That’s what has happened to Grandma too! It’s quite mysterious. One day she’s writing and sharing about her surf life and the next she’s gone! After chronicling for five years, there were no more posts. They began in 2005 and ended in 2010. After her last post in May 2010, I was going to ask the question, “Where have you gone, Grandma?”, but I was stopped by a comment from her friend Julie Lawrence. She identified Grandma as Linda. Linda had never used her real name in the blog. It said that she was missing and that the NYPD was involved. I’m rarely bothered by the absence of a surfer in the lineup. Either they’ll show back up or they won’t. But I have been haunted by the idea of this woman, Linda, disappearing from her blog. It’s abandoned. What happened to her? Unlike, the writer, Agatha Christie, who reappeared in eleven days, this woman has been gone for one year and seven months. Did she keep surfing and decide the blog was too much trouble? Is she in the line up in Long Island or did she beat it for warmer waves in the tropics? I wrote Julie Lawrence and got no answer. I wrote to the Surfing Grandma of OC, another follower of Linda’s blog. She too was concerned, but had no news. I wrote to Alan Weisbecker, author of Why Can’t You Get Along With Anyone, as well as, In Search of Captain Zero. Linda admired him and mentioned him in a few of her posts. He didn’t know Grandma. I never surfed with Grandma. I never met her. But, I feel as if I’ve come to know her through her blog. She has become a long lost surfing buddy. Does anyone know the whereabouts of Grandma? Has she just gone surfing or has there been foul play? Did she engineer her own disappearance for some unknown reason? I second what Grande Jefe said… I’m pretty sure I would have like reading Grandma’s blog as surfing came into my life pretty recently and I can identity with a few things you’ve mentioned in your post today BUT I’m doing my best to not let it get to me anymore – ah! AND I’m glad you’re writing this blog too 🙂 See you in the water!!! Grandma’s posts are still up. Just google, Grandma’s Gone Surfing, and start reading. I don’t get why you would take the name of her blog instead of coming up with your own name. Maybe she just doesn’t want to continue writing, but presumably she’s still paying for the hosting. I think you are misunderstanding something. My blog is Fish Eye Farm. Did you read her blog? She disappeared and the police were looking for her? I think there is a failure to communicate here. Feel free to ask more questions. She was a good writer and I was contacted by other people also concerned about her. It’s a literary post. Use your imagination. Previous Previous post: Creating good days!